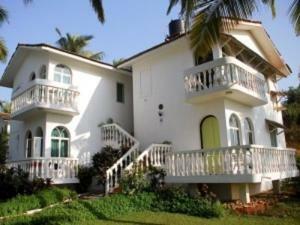 Colonia Santa Maria is a traditional Portuguese colonial villa situated on Baga Beach. It offers an outdoor pool with a sun terrace and loungers. Modern rooms are wired with cable TV channels. Colonia Santa Maria (P) LTD is situated 14 km from the capital city of Goa Panaji. Tivim Railway Station is 18 km away. Spacious rooms each have a generous lounge area with a sofa. A minibar and tea and coffee-making facilities are provided. A balcony is included in each room. Staff of the hotel can assist with business and sightseeing needs. Guests can pamper themselves with a treatment at the beauty salon. Cars can be rented for sightseeing tours. The Balcao is a restaurant providing seafood, European and North Indian cuisine. Traditional Goa specialities are also featured. Free! All children under 5 years stay free of charge when using existing beds. Maximum capacity of extra beds/children's cots in a room is 1. Any type of extra bed or child's cot/crib is upon request and needs to be confirmed by the hotel.